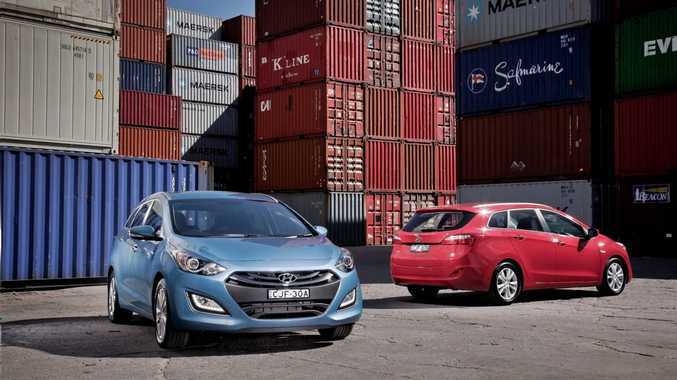 WAGONS, be they sports wagons, small or large wagons, don't seem to be as popular in Australia as they are in Europe so it is little wonder that Hyundai considered eliminating theirs from the new i30 line-up. Yet if the truth be known, wagons are the dark horses of passenger-carrying vehicles, their innate capabilities masked by their underdog status. However, once romanced by their charms it is difficult to take a backward step, difficult to dismiss their unique blend of space and features and difficult to ignore as a real competitor to that flavour of the month, the SUV. In its quest to dominate our market Hyundai, which has become a force to be reckoned with in the last few years, has voted to retain its wagon here, calling it the Tourer. The Tourer is made in Hyundai's factory in the Czech Republic and is available in petrol with a manual and auto transmission and in a turbo-diesel mated with an automatic box only. The interior of the Tourer is a carbon copy of the i30, bar the adjustable backrest, so you can be sure you are getting top value for your monetary outlay. The cabin is spacious and conservatively but appropriately laid out with the buttons and dials most used close to hand. Like in its smaller counterpart, the console of the Tourer is dominated by the infotainment screen which in our Elite test car included a sat nav system. 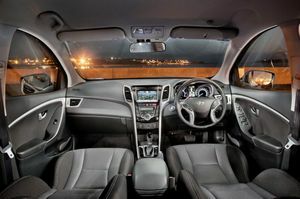 Inside the Hyundai i30 Tourer. The cloth seats (there is no leather option) are comfortable and supportive but despite an attempt at a more upmarket appearance there is still much hard plastic around with brushed metal highlights a poor imitation. Still, though it is a great improvement on much of the competition and are mentioned as an aside rather than a true complaint. Space, as you would expect in a small wagon, is generous both front and back but not overly so. Rear-seat passengers certainly won't feel squashed with plenty of knee and head room although the same care has not been taken in accommodating adult feet under the front seats. While the Tourer shares a wheelbase with the i30, it is 185mm longer than the hatch which seems to equate into a sizeable amount of load room, 528 litres with the seats up growing to 1642 litres when they are stowed - interestingly much more than small SUVs of the same ilk. 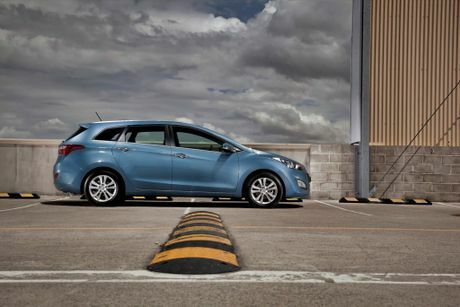 Our i30 Tourer Elite was powered by a 1.6-litre turbo diesel engine ably accompanied by a six-speed automatic transmission. All-in-all it is a more than competent little unit that will always give off its best and is unlikely to leave you stranded. Road manners are good, the Tourer benefiting from an independent suspension not seen in the i30, and although there is some understeer when you pull it sharply into a corner, the Tourer holds its nerve with aplomb. Steering feel is patchy at best despite Hyundai's Flex Steer system which allows the driver to choose from Comfort, Normal and Sport modes. To speak plainly, there is little noticeable difference with the Sport mode most pronounced but choosing heavier and stiffer as its trademark. As much as I would like to think that even drivers confined to the family wagon would give their eye-teeth for some performance excitement, it is the case that most drivers rate comfort, reliability and space well above that thrill in the pit of your tummy. So in that regard the Tourer, any regard really, is far from disappointing. 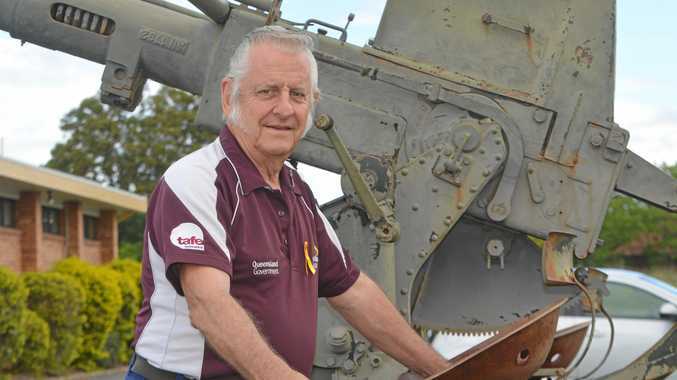 The small engine, despite its considerable torque, does struggle a bit under load and will need some urging up steep inclines and on the highway until you get to speed. Hyundai is known for its inclusions and its reputation will not go wanting here with the Tourer, especially the top-of-the-range Elite, equipped with many of the niceties missing in small SUVs in the same price point. The entry-level Active boasts intuitive Bluetooth compatibility, cruise control, LED daytime running lights, Flex-steer system, reverse sensors and keyless entry. The Elite adds a seven-inch display, sat nav, reverse camera, dual-zone climate control, auto headlights and wipers, automatic folding side mirrors, auto windscreen defog and illuminated door handles and puddle lamps. Safety, as you would expect, is five star and features seven airbags, traction and stability control, ABS brakes with EBD and brake assist and a Vehicle Stability Management system. The small wagon segment is hardly bursting at the seams and the value-laden Tourer will do well against competitors like the Holden Cruz Sportswagon (from $29,790), Renault Megane Sportswagon (from $30,990), Peugeot 308 Touring (from $31,990) and the Volkswagen Golf Wagon (from $31,990). Space and efficiency combine with quality inclusions to make the Tourer a considered option for both young and growing families as well as older couples with empty nests. This small wagon is more than acceptable both in the inner city and on open roads with excellent manoeuvrability and acceptable road manners. A reverse camera should be standard in the entry-level Active as well as should the map pockets because how much do the latter really add to the cost? At 7.4l/100km our test car was thirstier than the claimed 5.8l/100km but still within the acceptable range. Hyundai offers an amazing five years unlimited kilometre warranty with the first three services capped at $289 each. The Tourer carries Hyundai's Fluidic sculpture design which translates into a much more appealing look than some of its staid competitors. A dark chrome effect grille, stylish built-in roof rails and sporty 16-inch twin-spoke alloys enhance the look. The i30 Tourer offers an alternative to those who want more space than a small car but all the luxuries and can't be bothered with the intricacies of a SUV. Of course this is no sports performance car but it is practical and comfortable with nice styling and good inclusions with a price tag that most would consider value for money. What we liked: Versatility, inclusions, looks. What we'd like to see: Reverse camera entry-level model, more oomph. Warranty: Hyundai offers a 5-year unlimited kilometre warranty with three fixed-price services. Model: Hyundai i30 Tourer Elite. Details: Five-door front wheel drive small wagon. Engine: 1.6-litre turbo diesel generating maximum power of 94kW @ 4000rpm and peak torque of 260Nm between 1900 - 2752rpm. Consumption: 5.8 litres/100km (combined average). Bottom line: from $31,390 ($22,990 for petrol Active manual).